【3-in-1 one step hair dryer&hair straightener&hair curler】: Perfectly combine a hair dryer with styling comb. You can blow-dry hair and make your hair curly or straight at same time ! Frizz Free Salon Plus Blow-dry in Up to Half the Time. 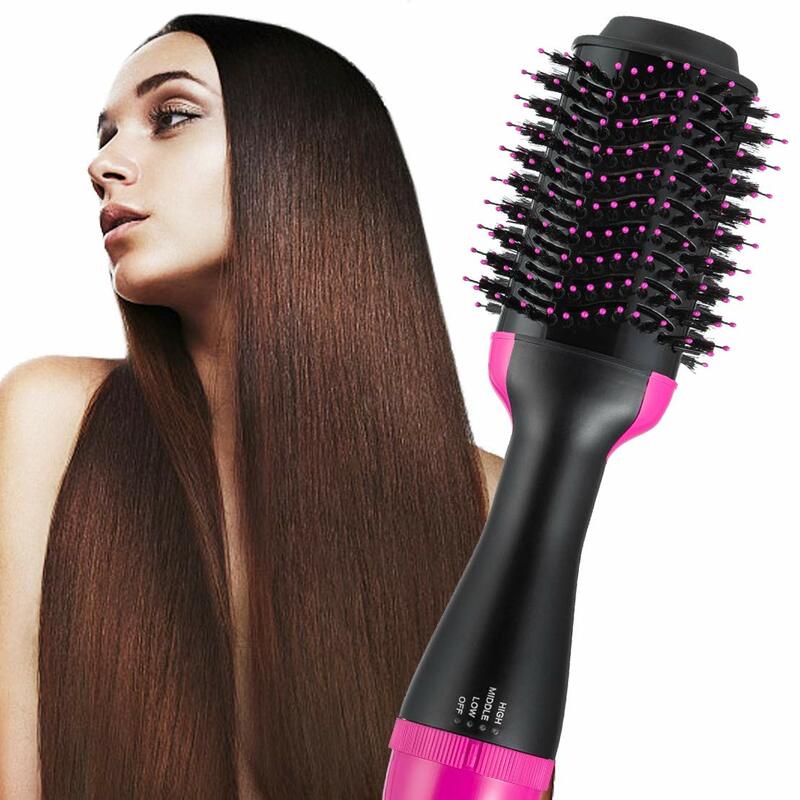 【Smooth results with less frizz in half time】: power of a dryer and precision of a styler; 3 settings and flexible tangle free bristles help dry hair, high heat setting is for thick hair, low heat setting is for fine thin hair. 【Tangle free hot air brush for all hair types】: Heat/Speed Settings provide three options for your styling flexibility. Blow dryer brush is beginner friendly and can be placed closer to the scalp for lift. Unique oval brush design is ideal for smoothing your hair while round edges create smooth volume and curled ends. 100% Refund & Lifetime After-sale Warranty. Just Email Us. Long, short, thick, damaged, colored, or extensions. 3.For smooth blowouts, place hair brush close to the roots, brush down toward the ends. 6. To curl ends, place hair brush under the ends, hold 2 to 3 seconds before rotating. 【One step hot air brush with ionic technology】: he negative ions released by the hot air comb can increase the moisture of the hair, reduce the damage of the hair, nourish the hair, make the hair smooth, healthy, soft and without static electricity. 【1000 Watt power provides just the right heat】: Unlike conventional hair dryers, this volumizer can be placed closer to the scalp for lift. Smooth and style your hair now. We offer 100% refund and lifetime warranty for aftersale service. Just email us.